We’d love your help. Let us know what’s wrong with this preview of Hymn by Ken Scholes. Ken Scholes completes his five-book epic that began with his acclaimed first novel Lamentation. The battle for control of The Named Lands has captivated readers for ten years as both characters and readers have learned the true nature of world called Lasthome. Now the struggle between the Andro-Francine Order of the Named Lands and the Y Zirite Empire has reached a terrible Ken Scholes completes his five-book epic that began with his acclaimed first novel Lamentation. The battle for control of The Named Lands has captivated readers for ten years as both characters and readers have learned the true nature of world called Lasthome. Now the struggle between the Andro-Francine Order of the Named Lands and the Y Zirite Empire has reached a terrible turning point. Believing that his son is dead, Rudolfo has pretended to join with the triumphant Y zirite forces but his plan is to destroy them all with a poison that is targeted only to the enemy. In Y Zir, Rudolfo's wife Jin Li Tam is fighting a war with her own father which will bring that Empire to ruin. And on the Moon, Neb, revealed as one of the Younger Gods, takes the power of the Last Home Temple for his own. To ask other readers questions about Hymn, please sign up. When will HYMN be out? So when is this thing out? Been a few years. Ruthfuss and Martin are holding their stories hostage..... Is this the case here? Anyone who knows me knows how much I love Ken Scholes’ five-volume Psalms of Isaak saga. Launched in 2009 with Lamentation, I remember being blown away by the addictively readable fusion of science fiction and fantasy, masterful world-building, and brilliantly intricate storyline. I’d never read anything quite like it—and that’s saying something coming from a book critic who has reviewed 8,000+ titles over the last 20+ years. I remember going so far as predicting that the Psalms of Isaak had the Anyone who knows me knows how much I love Ken Scholes’ five-volume Psalms of Isaak saga. Launched in 2009 with Lamentation, I remember being blown away by the addictively readable fusion of science fiction and fantasy, masterful world-building, and brilliantly intricate storyline. I’d never read anything quite like it—and that’s saying something coming from a book critic who has reviewed 8,000+ titles over the last 20+ years. I remember going so far as predicting that the Psalms of Isaak had the potential to redefine genre fiction—and I think it would have if it hadn’t been for a few unfortunate issues. 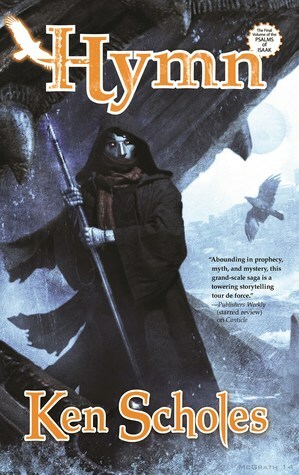 Tor radically changed the cover art design after the second novel (Canticle) was released in paperback, which threw many readers off, and there was a seven year gap between the release of the third novel, Antiphon, and the concluding volume Hymn, which was just released late in the fall of 2017. After the first three installments were released relatively quickly, the last two novels were three and four years apart, which is far too long for a society now obsessed with binge-watching or binge-reading entertainment. Yes, some authors can get away with this (GRRM, Rothfuss, etc.) but the vast majority of readers will eventually grow tired of waiting and move on to something else. Those readers who did stick around for the release of Hymn, however, were rewarded with a fitting end to the series. I’m not going to go into detail here and give anything away but I will say this: in terms of thematic profundity, Scholes hit it out of the park. So, like Jin Li Tam, as I reevaluate the now completed Psalms of Isaak, I’m struck with some revelations of my own. Regardless of the less than ideal publishing schedule and marketing plan, this series will go down as arguably the best example of what an author can achieve when they embrace their creative courage and audaciously blend together elements of science fiction and fantasy. Mind-blowing in terms of both narrative scope and storytelling depth, this saga should go down as an instant genre classic. Hymm marks the end of an era. The conclusion we had been waiting for comes crashing down on the Named Lands blurring the lines between mortals and gods, legends and facts. Suffice to say, this is one of those series that completely swept me away by the sheer audacity of the author's imagination. The only other authors I can think of are Brandon Sanderson (to an extent) and the much under-hyped Adrian Tchaikovsky. Years of gap between publications aside, Ken Scholes takes t What a ride it has been. Years of gap between publications aside, Ken Scholes takes the book to a rising crescendo before letting it fall in a final blaze of glory. The stories of Isaak, Neb, Petronus, Rudolfo, Vlad and Jin will forever be etched in my heart if not in the hearts of men of the Named Lands. The Psalms of Isaak is a creative mastermind, craftily combining science fiction into a tale that defines the fantasy genre. Like a master chess player going for the kill, Ken Scholes brings all the players into the game in this final novel and begins a bloodbath that even the Gods can't avoid. The bad guys turn humane and the good guys turn into monsters and in between are the kin-dragons, flying free again. Oh, what a ride this has been. Finally finished with the Psalms of Isaak. I think this series was a couple of years ahead of the resurgance of Dying Earth type stories and further hampered by a few publishing hiccups. Still this is a fitting end to an original and exciting fantasy series that needs more attention. As with every concluding volume of a series that's got 3 or more books, the main question I ask myself is: "Did the author succeed in wrapping up the story?" Short answer: Scholes mostly does. "Psalms of Isaak" is a very interesting series, that started with a very focused cast and plot-centered around the aftermath of a single profound event in Book 1, and proceeded to expand the scope of its story with every subsequent installment, introducing a rich and forgotten backstory dating back millenn As with every concluding volume of a series that's got 3 or more books, the main question I ask myself is: "Did the author succeed in wrapping up the story?" Short answer: Scholes mostly does. "Psalms of Isaak" is a very interesting series, that started with a very focused cast and plot-centered around the aftermath of a single profound event in Book 1, and proceeded to expand the scope of its story with every subsequent installment, introducing a rich and forgotten backstory dating back millennia before the earliest memories that the plot's principal societies have. There's a reason volume 4 needed a sizeable glossary to help the readers make sense of all the hints and tidbits dropped throughout the story. In my review of Book 4 I noted that I was feeling that Scholes might have created a world too big and a history too rich for his story to contain. You can imagine my trepidation, then, when "Hymn" starts by introducing a brand-new faction into the plot-one whose initial description and role practically screams "deus ex machina plot device!". I was skeptical, and not a little bit worried. But I must say, Scholes manages to write them into the story in a way that makes sense, and limits their actual impact well. Although in several points they DO move the plot along rather conveniently, at others, their well-intentioned interference throws spanners into various characters' works in original ways. Overall, the plot feels rushed, but at the same time, manages to lack urgency. The major "end game threat" that emerges towards the end isn't exactly a surprise, but at the same time, it's not entirely convincing. It's strange, and difficult to explain while keeping spoilers to a minimum, but the main premise revolves around several clashing plans as to how to finish undermining a common enemy, where the various character's motivations and plans result in irreconcilable differences of opinion over what seem to be minor philosophical disputes. While the plot and the story works, and it delivers a suitably epic and bittersweet conclusion, doing a good job to give closure to all principal characters and, at the same time, avoids a definitive "happily ever after" end-all finale, the way things get there can feel more than a bit contrived, once I look back at it more critically. Simply put, worth the wait. Ken Scholes final work in the Psalms of Isaak is a fitting swan song for the series. Our favorite characters are back with complex challenges and goals. The world building somehow manages to extend and enrich the already well-defined setting. Scholes' writing is at best when depicted the "tough conversations" and those crucible moments every great character must face and overcome. The pace is an interesting combination of frenzied action, perplexing mystery, pauses, un Simply put, worth the wait. Ken Scholes final work in the Psalms of Isaak is a fitting swan song for the series. Our favorite characters are back with complex challenges and goals. The world building somehow manages to extend and enrich the already well-defined setting. Scholes' writing is at best when depicted the "tough conversations" and those crucible moments every great character must face and overcome. The pace is an interesting combination of frenzied action, perplexing mystery, pauses, unexpected twists and revelations. Just a great hodgepodge of fascinating work. At times the work does lean towards info-dumpy but not too much so as to detract from the story at hand. I have thoroughly enjoyed the entire series. The wait for Hymn seemed like forever but turns out, well worth it! The story telling is such that you feel like you're in the middle of it all. You feel the deep pain, sorrow, love all in a unique and fresh setting! I was fortunate enough to discover Ken Scholes through a writing workshop when the first four books of Psalms were already in print. I adored the first book, struggled with the second, and found my way again with the third and fourth volumes. In this last book, Scholes moves a lot of pieces around the board, setting up resolutions for the characters and the many, many plot threads in this grand tapestry. Not everything worked for me, but I see where the writer made his choices and why. The importa I was fortunate enough to discover Ken Scholes through a writing workshop when the first four books of Psalms were already in print. I adored the first book, struggled with the second, and found my way again with the third and fourth volumes. The important thing was the emotional weight of the story: I cheered and grieved for these people, and suspect that I'll returned to The Named Lands in the future and experience the entire journey again. A good enough conclusion to a series that does some really impressive work deconstructing cycles of violence and revenge and critiquing religious fundamentalism but doesn't undo the plot issues introduced in the middle volumes (with the characters' loyalties, betrayals, and motivations becoming so labyrinthine as to be incomprehensible). I've devoured Ken Scholes' books every time he's published one. The final volume was like a fine, gourmet dessert. Rich and complex and you just want to savor every bite. Read the series and know the ending is exactly the right kind of meal that leaves you fulfilled and satisfied. Good ending to the series, though it took me awhile to remember some things, since it's been so long since I read the previous book. I highly recommend this sci-fi/fantasy series, with the caveat that it's pretty dark. A worthy conclusion to a very solid series. I loved how chock full of ideas this series was. There were maybe too many viewpoints towards the end, but overall it was excellent. Steampunk with science fantasy elements alongside epic fantasy. The series as a while develops greatly over time. Worth the wait!! Thanks Ken! If you haven't read this series - do yourself a favor and read it! A worthy conclusion to a very solid--at times lovely and startling--work of science fantasy. A lovely and fitting end to the journey this series has taken me on. A fitting end to the Psalms. I would just like to say that I really, REALLY want a kin-dragon! Picking up immediately where Requiem left off, Neb still needs the staff that Vlad Li Tam is using to terrorize the Y’Zirite Empire. Amyle D’Anjite has disappeared with her kin-dragon, on a mission to oppose Neb and the work he and Patronus are doing on the moon. Orius, Lysias, and Rudolfo work towards clearing the Named Lands of Y’Zirite soldiers. In the aftermath of the Final Dream, Winteria Bat Mardic begins preaching again. And mysterious allies finally show themselves. This is the fifth and final book in the Psalms of Isaac series. I’ve long since given up trying to figure out what’s going to happen next in these books. There are so many surprises and major twists. A new group shows up in this book that ends up playing major roles along the various storylines. While I sympathized with (and in some cases agreed with) a few of Vlad Li Tam’s actions, there hit a point where I agreed with other characters that he needed to be stopped. Jin Li Tam makes some surprising choices, and I was impressed with how Rudolfo dealt with his further losses. At one point I was convinced that the author had forgotten about Lynnae, Jacob’s wet-nurse, and so was very happy that she turned up again. The ending was fantastic. It came with more revelations about the people, and really tied off a lot of character threads. There were tears (in book and in person), and moments of joy. Ken Scholes is the award-winning, critically-acclaimed author of five novels and over fifty short stories. His work has appeared in print for over sixteen years. His series, The Psalms of Isaak, is published by Tor Books and his short fiction has been released in three volumes by Fairwood Press. Ken's eclectic background includes time spent as a label gun repairman, a sailor who never sailed, a so Ken Scholes is the award-winning, critically-acclaimed author of five novels and over fifty short stories. His work has appeared in print for over sixteen years. His series, The Psalms of Isaak, is published by Tor Books and his short fiction has been released in three volumes by Fairwood Press. Ken's eclectic background includes time spent as a label gun repairman, a sailor who never sailed, a soldier who commanded a desk, a preacher (he got better), a nonprofit executive, a musician and a government procurement analyst. He has a degree in History from Western Washington University. Ken is a native of the Pacific Northwest and makes his home in Saint Helens, Oregon, where he lives with his twin daughters. You can learn more about Ken by visiting www.kenscholes.com.